Wormhole can be advanced and its rez cost is lowered by 3 for each advancement token on it. subroutine Resolve a subroutine on another piece of rezzed ice. As through the door of light he came. This, in my opinion, is the strongest of the space ice, and probably the most interesting code gate in the game. It's not quite as straight-up taxing as Tollbooth, although it's close (one less when encountered with the standard Shaper decoders, 3 less with D4V1D). However, in place of your boring etr subroutine, you have the most magnificent subroutine on a piece of ice in the game: the ability to resolve ANY other subroutine. "It's cool in theory," you say "but, really, you will end the run 95% of the time." FINE! End the run, if that's the strongest play. But, what if you have a destroyer rezzed? Or AP ice? Or Architect? Or NEXT Gold?! The ability to choose what happens from so many things, on a strong piece of ICE that is likely to hit, while still being able to end the run, is just great. This is auto-include for 1 or 2 in every Weyland deck, IMO. It shines, like all of the space ICE, in Blue Sun because of the OAI synergy, but the advance ability also makes it viable for less economically powerful IDs, and other factions (though a piece of ICE sitting with 3 advancement counters on it is a bit of a giveaway). Wormhole has one major drawback: You need other non-wormhole ICE rezzed or it does absolutely nothing, so it's not that strong early game as a first-rez. But no 9 rez ICE is going to be ideal for your first piece on a central server. This card can give you incredible mileage in Jinteki: Replicating Perfection or Industrial Genomics: Growing Solutions. Firstly it lets you stack advancement tokens, this means it can be a target for Space Camp and Trick of Light. Inside Weyland it can also benefit from Shipment from Kaguya, Hollywood Renovation or any of the other cheesy Weyland cards that allow/help you advance Ice. Secondly it lets you use any subroutine, this is great because some of the best ice for these Jinteki decks are Excalibur or Susanoo-No-Mikoto which are both Uniques. Furthermore it can be used to fire net damage subroutines such as Neural Katana or trash a program routines from other Ice like Ichi 1.0, Grim or Swordsman. It also fills in a big gap in Jinteki ice - it can also let you end the run. 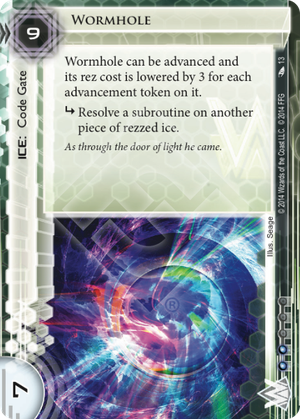 Remember Wormhole lets you fire off strong subroutines that have the misfortune of sitting on low strength Ice or Ice that don't often get encountered, so don't forget Architect or Crick. An even weirder possibility is to use it to trash hardware by combining it with Taurus or using it to 'refire' failed traps like Whirlpool. Another benefit of this ice compared to staples such as Komainu is that it is not vulnerable to Parasite. Weaknesses: Wormhole can be a Femme Fatale target, it can be broken for 1 counter with D4v1d and it can also be broken with Knight. Once you advance it, it will also be the first piece of ice that gets bounced by Leela Patel: Trained Pragmatist's ability. The cost could also be considered a weakness, since it costs a combination of 9 or 3 advancement tokens to rez it. It's worth noting that it loses one of the big benefits of Ice by telegraphing itself as an advancable, although it can make up for it in flexibility. Lastly Wormhole is completely worthless if you don't have any other Ice rezzed, so you will need to support it by playing other Ice with useful subroutines. Janky Combos: I don't recommend trying for this sort of thing but you could try and combine it with Inazuma, Sensei, Marker, TL;DR, Flare, Shinobi, Bullfrog or even Cell Portal. Marcus Batty is a more reasonable and realistically landable combo which can potentially do some damage as well. TL;DR into Wormhole with another Wormhole and a Caduceus rezzed on the board. Infinite money loop for you and your friends. Wile away the infinite time loop by thinking about your mom, picturing different animals, and practising your frisbee wirst flick technique. The game ends when the runner leaves.